SACRIFICE just wasn't what I was expecting. Perhaps I had too high of hopes based on all the build up over the previous books and novellas, but I just don't feel like this book gave the series the proper send off that it deserved. Things just were not settled at all in the end and were left far to open for my tastes. Perhaps that means that this series isn't actually finished, but I'm not really sure who the next book would be about as all of the characters have seen their "day." Even so, putting the lack of a finalized ending aside, I still don't feel like this book was as strong as the previous ones. Michael just seems stuck in an overbearing protecting rut, shutting the rest of the world out and refusing any help. Frankly while some of that showed in the previous books, him being wise and the glue that held the family together was what came through more. I loved how everyone could really count on him to be fair and know what to say to reassure them. So I was really excited to see things from his side, but unfortunately felt let down as that element just seemed missing this time around. That being said, he did grow by leaps and bounds by the end of the book, so there's a plus, but again, I would have like to have seen more of the Michael that's we've seen in the previous books rather than how things played out in this one. Another character that came across completely differently than had been previously portrayed was Hannah. I just didn't get her at all. Never would I have guess she would have had such a chip on her shoulder, and so many of her actions came across as childish and immature despite her claiming to be a grown up. It just didn't jive with what had been shown before, and it left the romance stilted and stale. With Michael being so closed off and Hannah being anything but understanding about everything, I was left scratching my head at what was really going on there. I mean they are supposed to be two adults in a relationship, and yet, there just didn't seem to be anything real there. I just didn't get it, and it soured the read for me. 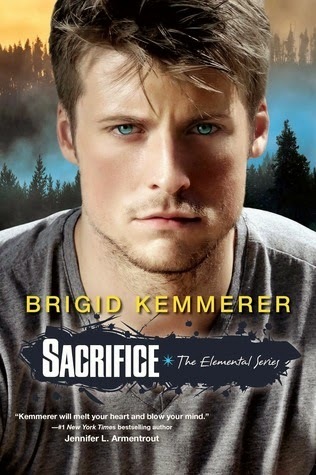 The plot behind Sacrifice left me wanting more as well. The villain seemed just a bit over the top as liked to play with his victims which is in complete contrast to anyone the brothers have faced previously. I'm not sure I liked this element. Sure, it ramped up the tension a bit, but I don't think it drew me in emotionally toward their plight, and when you consider just how much craziness occurs in this book, I should have been more emotionally invested. Unfortunately I just wasn't making this a mediocre read overall for me. I wanted so much more from this book and it just wasn't there. I still think fans of the series should read SACRIFICE to see Michael's side of things and hope along with me that the series will be continued.